When Will Apple Boost Its Dividend? Soon. The one-year anniversary of Apple's dividend on March 19 came and passed with no announcement from Apple to boost its dividend. Leading up to the anniversary, there was a lot of speculation around what exactly the company could announce. Though the buzz has faded, it doesn't mean Apple won't announce a plan to return even more cash to shareholders. In fact, investors should rest assured -- an announcement is basically inevitable. Just over a year ago, Apple announced plans to initiate a dividend and share-repurchase program. The quarterly dividend amounted to $2.65 per share. At today's share price, the dividend yields a 2.4% return to investors. Apple's share-repurchase program meant repurchasing $10 billion in shares over a three-year period. Even at the time of the announcement, the payout seemed conservative. But a year later, investor concern looms: Despite Apple's payouts, its massive cash hoard -- now more than $137 billion -- is still growing even larger. Investors want in on it. David Einhorn of Greenlight Capital made headlines in February, when he proposed that Apple pay out some of its cash in the form of preferred stock. Apple responded with an official statement, admitting that the company has found itself "in the fortunate position of continuing to generate large amounts of cash, including $23 billion in cash flow from operations in the last quarter alone." The statement asserted, "Apple's management team and Board of Directors have been in active discussions about returning additional cash to shareholders." If it isn't clear already, Apple has enough cash sitting around to pay out more to shareholders. 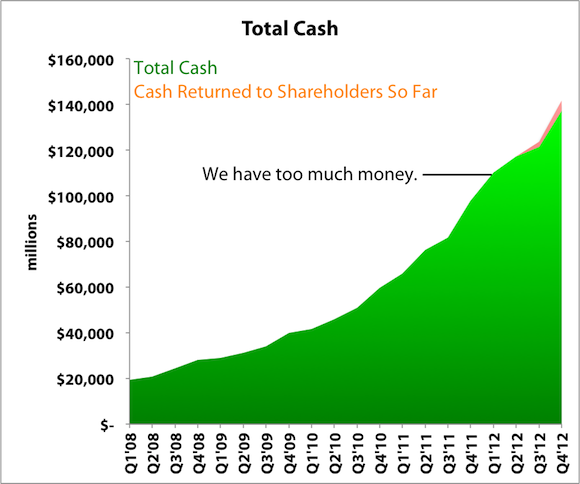 In fact, Apple has $145 in cash on its balance sheet for every share. "The only thing that Apple can't do is nothing," Fellow Fool Evan Niu asserted. Apple's returned only a "sliver of cash" so far. Evan illustrates his point with this mind-boggling chart. Source: SEC filings. Calendar quarters shown. Cash returned includes dividends and buybacks. Chart created by Evan Niu. Apple must inevitably return more cash to shareholders in the near future. CEO Tim Cook's statements at the 2013 Goldman Sachs conference again reiterated management's recognition of its enormous cash pile: "We do have some cash. ... And it's an incredible privilege for us to be in a position that we can seriously consider returning additional cash toward shareholders." Topeka Capital Markets analyst Brian White projects that Apple's cash balance could reach $241 billion by the end of fiscal 2015 if the company doesn't return more cash to shareholders than it already is. Though Apple may have fully qualified as a growth stock several years ago, it's now a top-notch dividend stock. In fact, the stock's qualities as an income investment are largely undervalued. Apple's current dividend yield of 2.4% may not seem very attractive to income investors. But with a likely dividend increase on the horizon, and given Apple's enviable ability to generate large amounts of free cash flow, the stock is a first-class bet for future income -- especially at today's conservative valuation. A key metric income investors care about when analyzing the quality of a company's dividend is the payout ratio. The payout ratio is simply equal to a company's annual dividend divided by its annual earnings. The higher the ratio, the less sustainable the dividend if business fundamentals go awry. Most established dividend stocks have payout ratios well over 50%. Apple's is just 12%. Microsoft and Intel , two well-recognized dividend stocks in the tech sector, have payout ratios of 45% and 40%, respectively. Keep in mind: The lower, the better. Another key measurement in assessing the quality of a company's dividend is a its ability to generate free cash flow, or the cash that can be used to pay out dividends. Apple has an unearthly ability to turn $0.28 of every dollar of sales into free cash flow. That's practically unheard of in the consumer-electronics hardware industry. Microsoft manages to do better, with a free cash flow-to-sales ratio of 38%, but this is expected -- the company's primary businesses is selling high-margin software. Intel, despite its market leadership, earns just $0.15 of free cash flow on every dollar of sales -- considerably less than Apple. Apple, therefore, has excellent prospects as a dividend stock. In fact, analysts surveyed by Bloomberg collectively believe that Apple will boost its dividend to $4.14 per share. That amounts to a dividend yield of 3.7% -- far higher than today's yield of 2.4%. There is no denying it. Apple has too much cash. The company will probably make an announcement to return more of it to shareholders soon. This is just one of many reasons the stock is a top pick among my outperform CAPScalls. Income investors should consider getting in on this top-notch dividend stock while the price is right. The article When Will Apple Boost Its Dividend? Soon. originally appeared on Fool.com. Fool contributor Daniel Sparks has no position in any stocks mentioned. The Motley Fool recommends Apple and Intel and owns shares of Apple, Intel, and Microsoft. Try any of our Foolish newsletter services free for 30 days. We Fools don't all hold the same opinions, but we all believe that considering a diverse range of insights makes us better investors. The Motley Fool has a disclosure policy.